Go meatless with delicious Cauliflower Walnut Taco Crumbles. 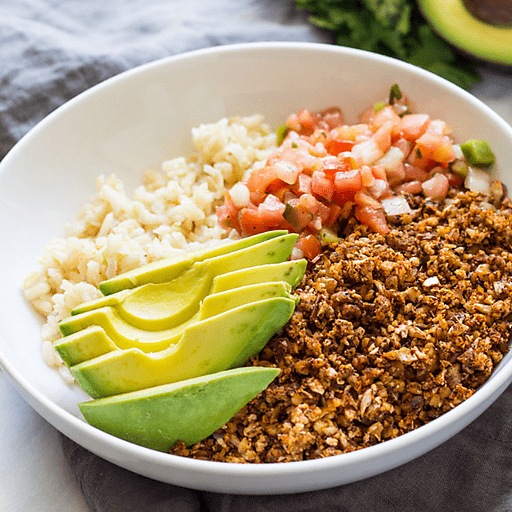 Made from just cauliflower, walnuts, chipotle peppers and a handful of seasonings, this plant-based “meat” is the perfect addition to tacos, burrito bowls and more! 1. Preheat the oven to 375°F. Coat a baking sheet with cooking spray. 1. Pulse all ingredients in a food processor until the mixture is evenly ground. 1. Transfer to prepared baking sheet. Bake for 30 minutes, stirring halfway through to prevent over-browning. To save extra chipotles, line a baking sheet with parchment paper. Using a fork to strain, place peppers on parchment paper. Top each with a spoonful of sauce. Freeze. Once frozen, peel peppers off of parchment paper and place in a ziptop bag for later use. Calories 280, Total Fat 26g (Saturated 2.5g, Trans 0g), Cholesterol 0mg, Sodium 440mg, Total Carbohydrate 10g (Dietary Fiber 5g, Sugars 3g), Protein 7g, Vitamin A 10%, Vitamin C 45% Calcium 6%, Iron 10% *Nutritional values are an approximation. Actual nutritional values may vary due to preparation techniques, variations related to suppliers, regional and seasonal differences, or rounding.